Or, visit an independent bookseller near you. The book is also available in French. 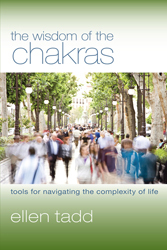 I began my study of the chakra system through observation, and I avoided reading books on the subject. I looked and learned everywhere. Whenever I saw people, I also saw the seven energy centers emanating from them. I gathered knowledge from my clairvoyance and from my guides from the spiritual realm that is contained in “The Chakra Book.” This book shows how the chakra system functions in everyday life, how our thoughts, words, and actions affect this system, and how the chakras shape us. It also provides practical tools that are easily integrated into daily life to heal each chakra and so attain the alignment that is the basis of a healthy and, I believe a spiritual life.